If you are a soon-to-be bride or groom, then chances are that you’re running around in circles trying to find the venue of your dreams. But if you’re stuck for inspiration and have been wondering what Delhi has to offer beyond Tivoli Garden and standard 5-star hotels, fret not; WedMeGood has you sorted. Looking for a venue with a rustic-yet-glam theme? The Woods is your go-to place. Located in Greenwood City, Sector 46, Gurgaon this beautiful venue has an old-countryside charm to it. With acres of modelled green, tranquil poolside area and swaying trees that make for a picturesque surrounding, it’s perfect for an intimate wedding. Set on the Delhi-Gurgaon border is this hidden gem. With a stunning outdoor pool, gorgeous banquets, lush green grass and beautiful lotus motifs running throughout the hotel, JüSTa Atrio is for timeless, elegant weddings. With a capacity of up to 650 people, you can easily throw your big fat wedding here. Need to go away from the city’s hustle-bustle yet not too far? This is your venue. The courtyard boasts of orchestrated water fountains and spectacular poolside views, giving the venue a flawless, aesthetic appeal. If elegance is your tagline, this wedding venue exemplifies it perfectly. It’s a go-to place for warm, elegant wedding celebrations for your guests. The hotel property is stunning, with a large poolside area that gets decked up with floating candles at night. With a history of over a century, Maiden Hotel has a legacy of endearing hospitality. The pearl-white façade of the building comes with plush greenery that has an old world charm, and makes for an ideal location for a scenic wedding celebration. If you’re all about chic and style, Fraser Suites is your go-to venue, offering fully-furnished luxury serviced apartments that will keep you guests in utmost comfort. The pool area can be used for a fun mehendi evening, too. It is a beautiful grand property, but doesn’t come with fussy surroundings despite being located in the center of the city in Mayur Vihar. If you want a palatial wedding with an old-world charm, you can find it right in your neighbourhood at ITC Grand Bharat (about an hour’s drive from Gurgaon). With exquisite architecture and a magical poolside seating with cabanas, it’s the perfect venue for a destination wedding-like arrangement. Zorba is a venue that is so aesthetically pleasing that one can do away with grand decorations and instead, just opt for minimal decor and lighting (Think fairy lights and baby’s breath). The property is perfect for a contemporary-style wedding, and the location at MG road makes it an even better choice. With an outdoor lawn that can accommodate up to 600 people and an indoor banquet that can seat up to 150, The Palm Club is best suited for outdoor brunch weddings. The beautiful pool provides a great focal point for mehendi pool parties, or even poolside pheras. If your idea of a wedding is an old-school farmhouse full of family and friends, the Golden Turtle Farm is your best bet. 45 minutes from Gurgaon off NH-8, this farmhouse is a perfect destination for an offbeat daytime sangeet or mehendi ceremony. Its ethnic décor comes with a hint of freshness, and is set against a beautiful landscape. Want a big fat royal wedding? Here is your venue. Located in Manesar, the Best Western Resort Country Club is a lush green paradise. You can host your guest in a tasteful style for a royal marriage celebration. The resort has an open space & unparalleled indoor-outdoor leisure activities for your guests. If you’re all about themed-functions, Pllazio can accommodate that need perfectly. Slick and luxurious, The Pllazio Hotel, Gurgaon is a building inspired by aristocratic European architecture that acts as a perfect backdrop for your wedding albums. The Manor is a gorgeous place to begin your new journey at. This luxury boutique hotel located in South Delhi lays emphasis on understated elegance. The beautiful sunset by the lawn also makes sure that you get stunning ceremony pictures for those early evening functions. 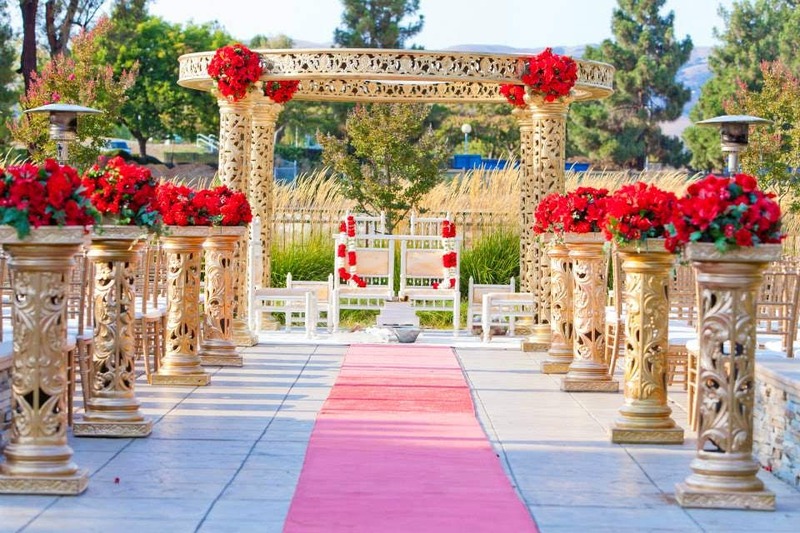 Find the perfect wedding venue for your wedding on WedMeGood.